Chelsea are reportedly keeping an eye on Philippe Coutinho from Barcelona with the future of Eden Hazard uncertain beyond the current campaign. The west London giants have regularly relied on Hazard to propel them to success in recent years but the Belgian could be leaving in the summer with his contract expiring in 16 months' time. According to The Independent, the Blues are likely to sanction Hazard's sale during the summer transfer window amid his reluctance to prolong his deal with the club. 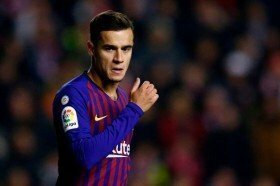 It is added that Coutinho has been earmarked as a probable replacement with suggestions that the Brazilian is unsettled with the Camp Nou giants despite only joining them 13 months ago. Coutinho has struggled to remain a regular starter for Barcelona during the course of the current campaign and his contribution has also been average with just four goals and two assists in the league. This has spread the speculation that he could fancy a return to the Premier League in the summer with both Chelsea and Manchester United possibly vying for his signature.